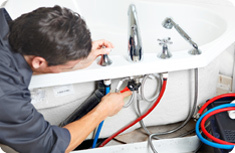 Our Plumbing and Heating department has 35 years experience in the Installation and design of domestic and light commercial plumbing and heating systems. Because we deal with all the leading manufacturers, we are kept informed of the constantly changing technologies and can assure you of the very best advice to ensure your installation not only meets your needs, but is designed to give optimum performance and reliability. Central Heating (Repairs and installations). Combi Conversions and Boiler Swaps. Bathroom Suites (Complete design & Installation service). Gas Servicing and Landlord Gas Safety Inspections.